Updated with second video (provided by NTT PR). 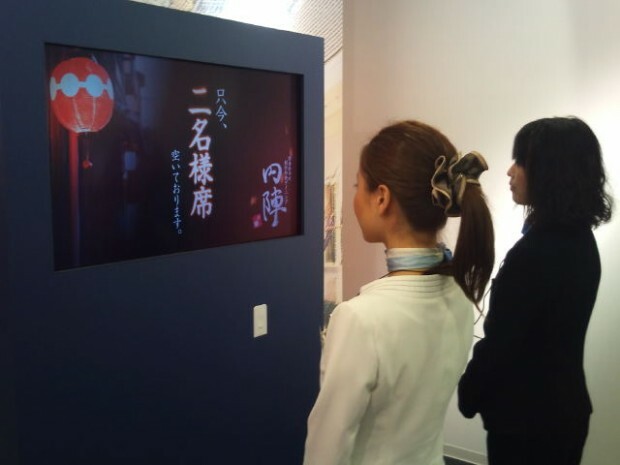 Here’s the second demo I witnessed at NTT‘s showroom “Note” [JP] in Tokyo: an “intelligent” digital signage system that actually holds the potential to offer value not only to advertisers but to users as well. We have shown you many such systems in the past (including one cool model from NTT), but this one’s a bit different. The system in operation at the showroom can not only detect the presence of human beings but also takes into account how many people are standing in front of it. For example, if two persons approach the display in the restaurant floor of a shopping mall, a camera installed in the ceiling right above the system immediately detects their presence. But instead of randomly displaying ads, the system pulls information from restaurants in its network and offers up ads only for those that currently have enough space for two people (shown in Japanese on the display on the picture above).